Pictures. We’ve all heard the saying. They’re worth 1,000 words. But, the real saying should be: The right picture is worth 1,000 words. Because when it comes to marketing, the right picture is essential. Pictures drastically increase social shares and engagement when paired with relevant content. They more than triple audience retention when used in marketing materials. And, they skyrocket online views. We’re proponents of hiring a professional photographer. (More on this later in the post.) But, sometimes hiring a professional isn’t an option. Sometimes stock photos just won’t cut it. Sometimes all you have on hand is your smartphone. Luckily, you can take some pretty awesome photos if you know how to maximize the potential of your smartphone’s camera. The following tips will help you take better pictures. Some of them are specific to Apple’s iPhone. However, many of them could be utilized with any camera. Nothing affects the quality of your photos more than light. Sometimes the only option is an alternative light source (such as a lamp) or an on-camera flash. But when possible, use natural light. Go outside or move closer to a window. Alternative light sources can give your pictures strange color tones. Natural light creates a truer, more authentic image. Your phone’s camera is pretty smart. But, sometimes it misses the mark on what the exposure should be. If you want to highlight an area that’s darker in the picture, you’ll need to increase the exposure. The iPhone allows you to adjust the exposure up and down. Simply tap to focus. A small sun icon will appear. You can drag it up and down to increase and decrease the exposure. Even with the iPhone 7 Plus’ new zoom lens, zooming in on a subject will cause the picture to be over pixilated. Rather, zoom with your feet. If you want a close-up, move as close to your subject as possible. Don’t ask us the exact science behind, but people respond better to groups of three. In photography, this rule might be better labeled the “Rule of Ninths.” Mentally picture your image divided by two horizontal lines and two vertical lines. This creates nine, evenly sized boxes. 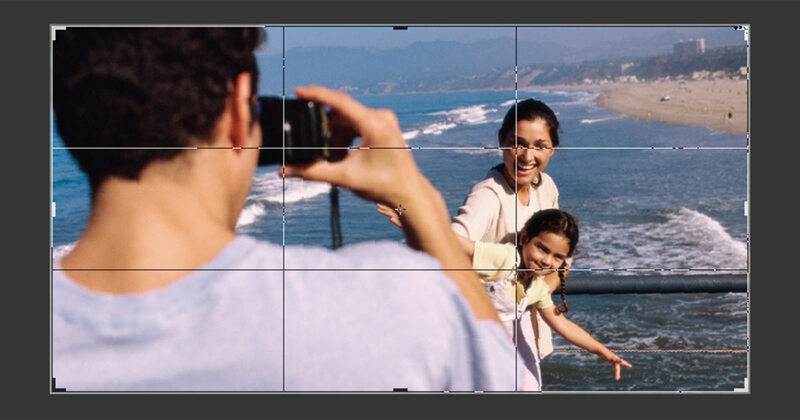 Rather than placing the subject in the center box, you want to move it to one of the four corners. This placement is more pleasing to the human eye. Depth of field refers to how much of an image is in focus. Think of the stunning photos you’ve seen over the years. Often these photos feature a subject in focus with a blurry background. With the iPhone 7’s new portrait setting you can create this same look. We spend most of our time holding our phones vertically. It’s only natural we’d take pictures that way too. But, vertical pictures don’t lend themselves well to be used for anything more than a selfie. By turning your phone horizontally and taking a landscape photo, you’ll get an image visitors will like much better. Asking your brain to crop in frame is only adding one more variable to the process. Why work harder than you need to? If you’re going to crop the image into a square, take it in a square format. This will help you compose a well thought out picture. Did the shot not turn out how you would have liked it? Sometimes getting multiple takes of the same image isn’t an option. Such as at an event or when you’re working with multiple people. But if it’s a scene you’ve staged, keep tweaking and snapping until you’re happy. Harsh shadows can make a picture off-putting to viewers. You can soften these shadows by placing a reflector on the shadowed side of the subject. (Just make sure the reflector is outside of the frame.) This will help illuminate the shadow, making the image pleasing to the eye. Reflectors can be purchased at nearly any photography store. However, you can save yourself some coin by using a piece of white cardboard. Heck, from time-to-time, we’ve even used a white napkin. As we said, we’re proponents of using a professional. If you’re investing the time and resources into promoting your business, working with a professional will help you put your best foot forward. Save your smartphone pictures for the occasional social share or blog post image. But, don’t plan on structuring a marketing campaign around them. Need some photography help? Talk to our creative team.